How is Ko Tarutao not more popular? Don’t get me wrong, there’s a massive part of me that definitely doesn’t want it to become more popular. What makes it so amazing, in fact, is that it is not very popular. It is remote, beautiful, and wild, and I absolutely love it. So returning after thirteen years, you might think there’d be a bit of bad feeling about the changes? Not at all. The moment the boat turned the corner around the cliffs, the huge, white beach stretched in front of us and I was instantly transported back in time. The beach has not changed. Not one bit. And long may it remain like this. A National Park it should be protected from development like this. Our stay in Tarutao was not as smooth as perhaps I would have liked. In fact, on our first night we were bitten to death by bedbugs (I had over 70 bites, our family total was over 300); as a result we ended up moving out of our rather nice looking bungalow into tents (where there were no bedbugs, but also no refund for us); then I had to return to the mainland for follow up treatment for an ear infection; just as we were getting into the swing of things Tettie had a bike crash (see Me and My Lucky Landings); it was only really during the last few days of our 10 day stay that we managed to have some proper ‘island chill out time’! Despite all this, Ko Tarutao has always been, and remains, a very special place for me. I can’t quite put my finger on why. It’s somewhere in the shade of blue that deepens towards the horizon, the contrast with the white of the sand, and the complete lack of any buildings of any kind on the coastline. The eagles and other birds of prey soaring overhead, the wild boar, the monitor lizards and the call of the crickets, plus of course, our trusty hammock, all just seem to combine into some kind of island perfection that I find irresistible. We left today. But I already know I’ll be back. I realise now that we’re on our last Thai island that my plan for blogging about each island as we travelled down the coast was somewhat flawed. I kept putting off writing about the island we were on, not sure I could give a rounded view until the end of our four or five day stay… but then we’d be moving on and I’d be too busy packing up, making last-minute travel arrangements and squashing our entire family into whatever combination of longtails, ferries, buses, taxis or other transportation we invariably had too many bags to fit comfortably into. Then, at the end of the journey, we’d arrive somewhere new and there would be no time in the excitement of moving in, unpacking and exploring to write about the place we’d left behind. Tucked away at the very northern end of the cost, within sight of Burma’s forbidden islands, Koh Chang has a ramshackle, laid-back charm. The sand is kind of muddy and the sea is both so salty it sometimes makes your skin sting a when you swim and too murky for snorkelling. And yet, with nothing much to do but wander the enormous beach or clamber in the rocks, stopping occasionally for a fruit shake to cool us down in a homemade-looking beach café, we really liked it here. No pretension. No pace. Just long-term, laid-back beach living. Chang’s glamorous little sister. The beaches here are whiter, the resorts smarter, the sea clearer, he crowd younger, there’s even a road. But it felt shallower and less likeable than the island we’d just left. And it was noticeably more expensive. Still, we had some fun days out here, especially sea canoeing out into the bay to explore its rocky islets. I visited these islands alone, on a live-aboard dive trip visited while everyone else stayed in Khao Lak on the mainland. Ten dives in three days was exhausting but there was no denying the beauty of these remote, National Park Authority controlled islands, both above and below the water level. I swam with sharks, saw astonishingly-enormous manta rays, moray eels, stingrays, sea anenomes incredible coral and, of course, a technicolour spectrum of tropical reef fish. I did miss the whale shark that was everyone else on the boat’s highlight (I was in the toilet at the time) but that aside, it was brilliant. In retrospect, I think we should have gone back there as a family and camped on one of the open islands as it was too nice here not to have shared it with my family. Not strictly an island but we did spend quite a while here, and Janet and the girls loved it. Not sure if that was Khao Lak or the swimming pool in our resort, though, where the girls happily splashed about for up to six hours a day while Janet chilled out reading and surfing the web. Reminiscent of Koh Chang, this was our favourite place on either coast at the time. The wide beach stretched for kilometres in both directions and, like Koh Chang, everything was built back behind the tree line, giving the illusion of strolling along the shore of a desert island. The food in our bungalows was excellent and the owners were lovely. It was a sad day when we left. We’d been looking forward to this one; Koh Mook was one of Janet and my favourite places last time we were backpacking. At first we weren’t sure we should have returned. The quiet, open coconut plantation behind the beach had been swept away to be replaced by a brash package resort and the bay was now so crowded with longtails that you could only swim in a tiny roped-off area. It was upsetting. But the view was the same, and we spent much of our time at the edge of the bay, away from the Charie’s Resort. We also, found a really cheap, delicious place to eat a little inland and within days had settled into a happy routine of eating, beach time, homeschool and watching hermit crabs. Plus we had some great days out sea canoeing, wandering rubber plantations and visiting Emerald Cave. What an experience this island could have been! 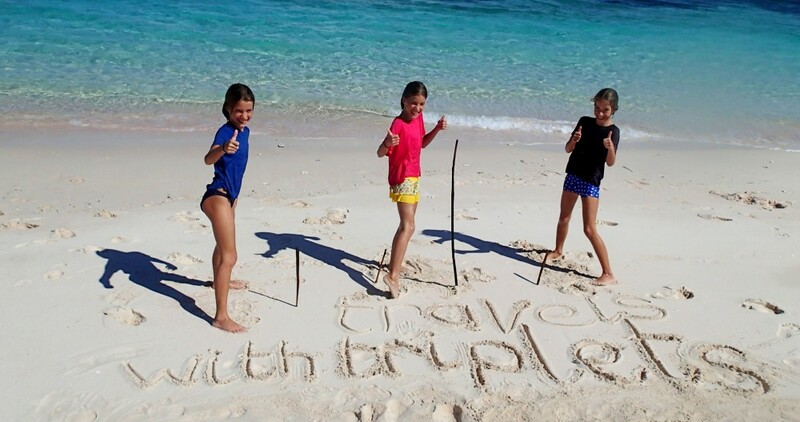 The sand is blisteringly white, the sea a magnificent turquoise, there are impressive coral reefs swimmable distances from shore; there can’t be many more picturesque places on Earth… and yet the resorts here spoiled it for us. Even though this island is supposedly part of the national park, the authority has sold off a strip along the coast, and the operations squashed into their narrow parcels of land seemed determined to make back every baht they had paid. The food was uninspired and overpriced everywhere, often twice the price it had been on Koh Mook, which we could see a few kilometres away. The bungalows were tightly packed and although it is undeniably beautiful, the beach is also narrow, meaning the holidaymakers were equally tightly packed along it. The best times we had here were trekking over the island through the jungle to as-yet-undeveloped Sunset Beach where locals have cleared the rubbish that washes up there and made it into strange sculptures along the shoreline. Phew! Arriving at Libong, it felt like I could breathe again. There was space on the beach, and between the bungalows. There were actually Thai people living there not just harried two week package tourists reading management books on sunloungers. And the food at Libong Beach Resort where we stayed was some of the best I’ve had in Thailand. Sure, the sea was very shallow, so you could hardly swim at low tide, but this quickly took over as our favourite island. And we saw dolphins. This was Janet and my dream island last time we travelled. We loved it so much here that when our cash ran out, we went back to the mainland, stayed just long enough to cash loads of travellers cheques and jumped back on the boat for another long stay. Tarutao is another national park island, this time is operated by the Park Authority itself. In the bay where we stayed (Ao Pante Malakka), there’s just one restaurant and you can either camp right on the beachfront or rent a neat little bungalow in the shady grounds behind. In the end we did both as our bungalow turned out to have bedbugs – Janet and the girls had over 300 bites between them after just one night. Elsewhere, getting eaten alive like that would have put us off but this was Tarutao so we switched to tents and stayed on. 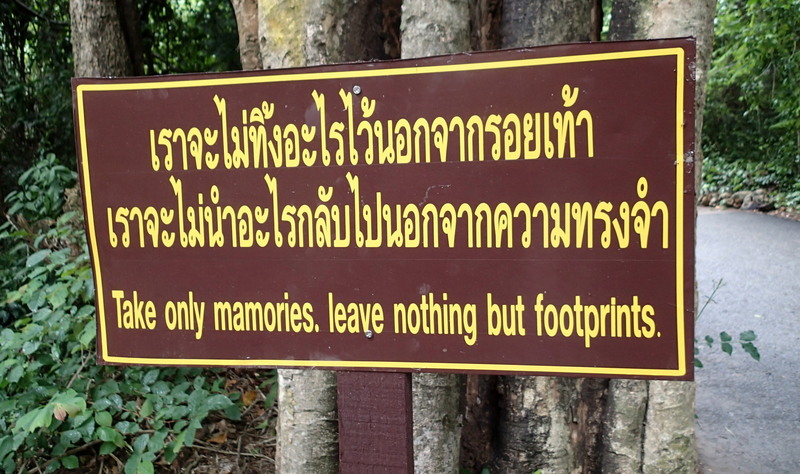 After all, unlike anywhere else we had been in Thailand, Tarutao hadn’t changed. How an island with a white-sand beach as wide as a football pitch and over three kilometres long (with another equally large a short rocky clamber south) has remained off the radar, I have no idea. Maybe it’s because there is nothing really to do there other than beachcomb, lie in hammocks, watch sunsets, swim, play frisby and occasionally wander away from the beach to eat, get a book from the library or climb the cliffs along an exciting jungle path for even more stunning sunset views. If you can muster enough energy, there are mountain bikes to rent (but be sure to check your brakes – the hills are steep), sea kayaks to rent and an old prison on the far side of the island to explore. But there’s no Western food, no wifi, no beach bars or dive schools, no beach furniture or touts trying to sell to the tourists. In fact, most of the tourists were Thai and judging by the crates of food, drinks, fish sauce and other supplies they brought, far too canny to buy overpriced tat from beach sellers. We spent ten days here; twice what we spent on most islands. We could happily have stayed much, much longer. 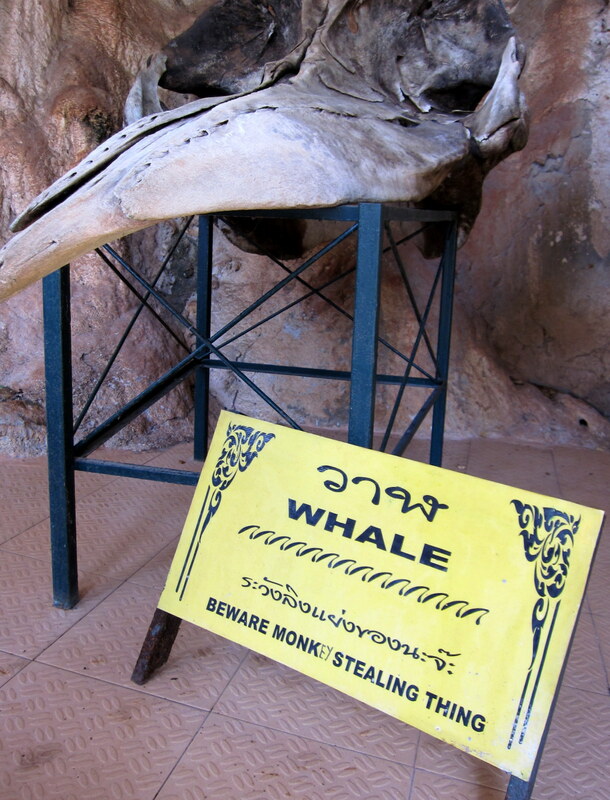 I realise now we should never have returned to Lipe. Thirteen years ago it was an undiscovered jewel, known only to travellers who managed to get this far off the beaten track. It has one short road, a few scattered bamboo bungalow resorts and the clearest, brightest waters of anywhere I’ve ever been. Now the islanders have, after having the fishing rights restricted, been allowed to turn to tourism. They have sold off all the beachfronts, which are packed with bars, cafes and resorts. Music pumps out until the early hours, replaced during the day with the rumble of JCBs and pneumatic drills as yet more resorts are thrown up. The locals have that shrewd, hard look I’ve seen in other places where farangs outnumber the locals by a large margin. The sea is so crowded with longtails you can’t swim on our beach at all (apparently that’s where the first profits always go – they’re the ultimate status symbol for the Cho Lay people who live here). You can still see the beauty of the isand underneath. But that makes it sadder if anything. And there you have it. 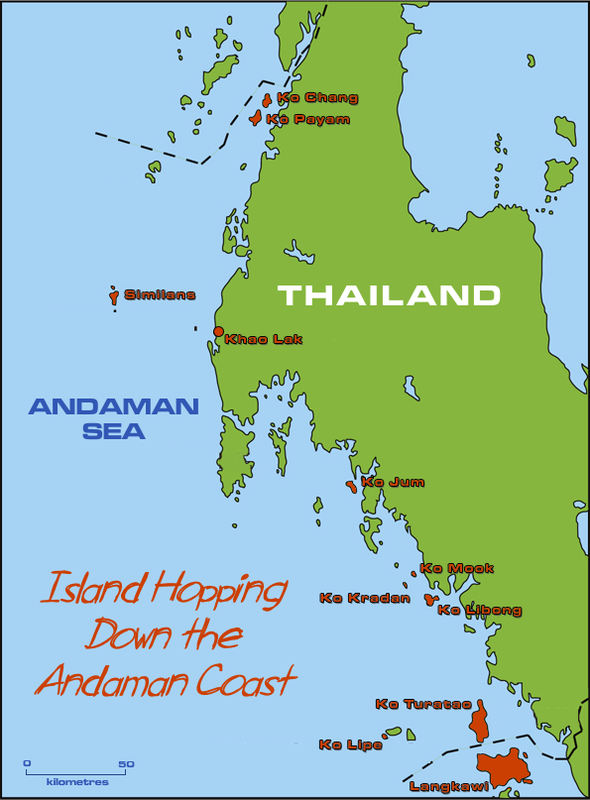 Our Andaman coast island hop. After two solid month of beach bumming, tomorrow we head off to Malaysia… to another island: Langkawi. In a shock turn of events, today, for the first time since November, the sun went behind a cloud. As if that wasn’t surprising enough, shortly afterwards a light breeze started up! How are we supposed to cope with such unpredictable weather?